Ledger 15 Days: Your Chance to Win a Free Ledger Nano X! 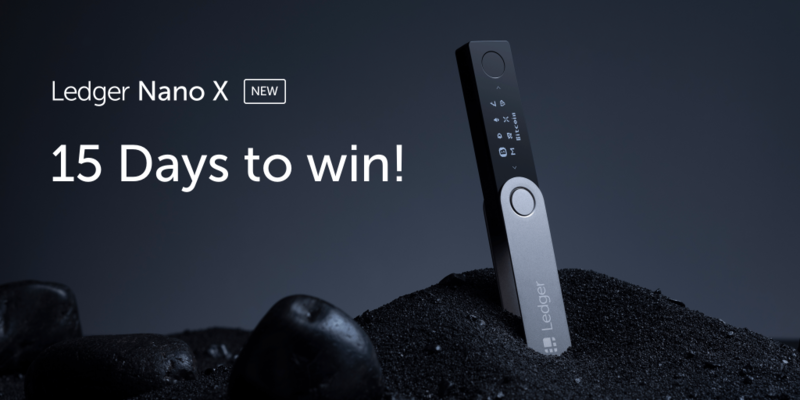 To celebrate the launch of the Ledger Nano X, Ledger is hosting a contest where 5 Ledger Nano X’s can be won! Not only that, but 10 Ledger Nano S’ are up for grabs as well, totalling 15 prizes for 15 individuals during the Ledger 15 Days contest! To enter the contest, go to this page. Once you have entered it with your e-mail address, you will be able to earn points. If you do not use the page linked above, you will not be accumulating any points – even if you perform actions that would otherwise earn points. During the coming 15 days, everyone who entered the contest can earn points by completing certain actions, most of them being on our social media platforms. You can increase your chances by performing these actions: the more points you have, the better your chances of winning. Underneath, you can find the actions you can perform to obtain points. Equally, it describes per action how many points you will receive. You must be at least eighteen (18) years old. Due to delivery restrictions, we cannot ship prizes to the following countries and regions: Iran, North Korea, Crimea and Sebastopol. Ledger Employees and their families cannot join (sorry guys). You can only enter the contest with one e-mail address, cannot refer yourself for the contest and can only complete each action once (except for referring). For the entire list of rules and conditions, please refer to the bottom of this page. The contest will run till the fifteenth of March. Good luck to all – we are looking forward to handing out these prizes! Ps. Some Ad Blockers may prevent access to the website for entering the prize. You may need to turn these off. The promoter of the competition is Ledger SAS, a French company, registered under number 529 991 119 with its registered address at 1, rue du Mail – 75002 Paris – France. You need to be an adult in your home country to enter this competition. Employees of Ledger or their family members or anyone else connected in any way with the competition or helping to set up the competition shall not be permitted to enter the competition. Contestants will get 100 extra entries for the competition whenever they refer another valid person into the competition, if this person confirms his/her email address. The prizes to win are five (5) Nano X and ten (10) Nano S. The value of a Nano X is 119 euros all tax included, and the value of a Nano S is 59 euros all tax included. Each participant can win one prize only. No cash alternative to the prizes will be offered. The prizes are not transferable. Prizes are subject to availability and we reserve the right to substitute any prize with another of equivalent value without giving notice. Prizes will not be sent to the following countries or regions: North Korea, Iran, Crimea, Sebastopol. Winners will be chosen at random by the VYPER algorithm. However, the more points or entries are earned per participant, the higher is his/her chance of winning. Note that all winners are selected at random and the highest number of entries does not guarantee any compensation. The winner will be notified by email within 28 days of the closing date with instructions on how to claim the prize. If the winner cannot be contacted or does not claim the prize within 14 days of notification, we reserve the right to withdraw the prize from the winner and to pick a replacement winner or to cancel the prize. Cheating for entries in any way (by referring yourself using different emails or by using similar tactics) will disqualify you from winning the contest. The promoter’s decision in respect of all matters that relate to the competition will be final and no correspondence will be entered into. The competition and these terms and conditions will be governed by French law and any disputes will be subject to the exclusive jurisdiction of the courts of France. This competition is in no way sponsored, endorsed or administered by, or associated with, Facebook, Twitter or any other social network. Privacy and Personal data: The personal data you consent to provide upon signing up to this competition will be processed by Ledger SAS and VYPER for the purpose and duration of the competition only. You have the right to request access to your personal data, their rectification or erasure, as well as the right to request the restriction of the processing or to object to the processing. You can do so by sending an email to Ledger at [email protected] or to VYPER at [email protected]. To learn more about how Ledger SAS processes your personal data, please visit https://www.ledger.com/privacy-policy.